Six common species of garnet are recognized based on their chemical composition. They are pyrope, almandine, spessartite, grossular (varieties of which are hessonite or cinnamon-stone and tsavorite), uvarovite and andradite. The garnets make up two solid solution series: 1. pyrope-almandine-spessarite and 2. uvarovite-grossular-andradite. AAA, extra fine natural gemstone from Tanzania. Lovely peachy pink. 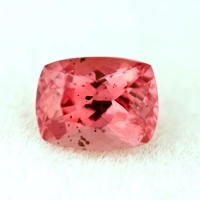 Rare Pink Garnet.